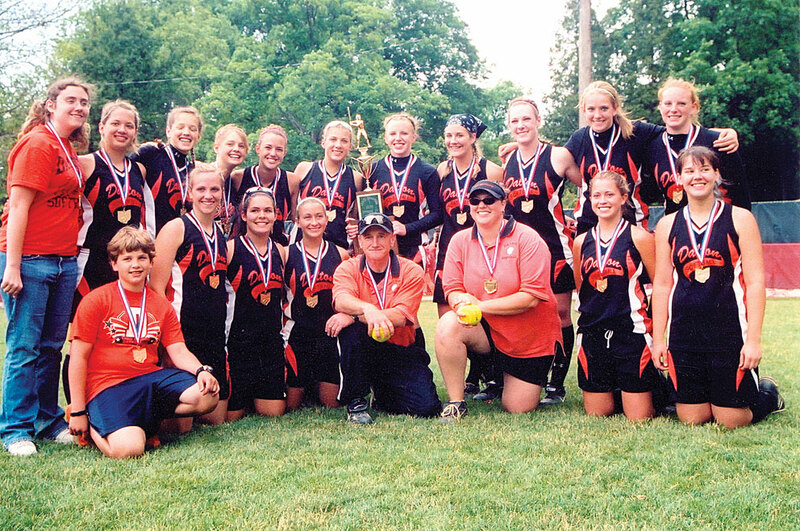 Nearly a decade later, members of Dalton High School’s 2006 and 2007 softball teams still enjoy looking back. Essentially, as Div. IV state champions in consecutive seasons, they are able to look Back-to-Back. Bolinger is part of the 2014 Wayne County Sports Hall of Fame induction class and Dalton’s back-to-back state title teams are also being honored. Not bad for a pair of squads that were unable to win a Wayne County Athletic League championship in either year. Dalton took nearly an identical tournament route to its 2006 and 2007 small-school championships. The Bulldogs defeated Strasburg in a pair of regional finals, then beat Convoy Crestview in two state semifinals, and turned away North Lewisburg Triad in the championship both times. “When I knew I wanted to get into teaching and coaching, I wanted so badly for my kids to experience the state tournament – maybe a state championship if things went right,” said Jessica (Miller) Matz, who also won a state championship as a player at Loudonville. “It was a dream come true for me. … It seems like such a long time ago, but it is a part of my life that will always be very special. Dalton was making its first state tournament appearance in school history in 2006, entering ranked No. 7 in the final State Coaches Poll. The Bulldogs were pitted against Crestview, the defending Div. IV state champion, the No. 1 ranked team in the state, and owners of a 59-game winning streak over two seasons. Crestview was 46th ranked nationally in the final regular-season Fab 50 poll compiled by Student Sports Magazine. But the Bulldogs scored six times in the bottom of the fifth inning, busting free from a 1-1 tie. Crestview starting pitcher Jamie Perkins entered the game with a 0.28 ERA and a perfect 20-0 record, but five Crestview errors and eight Dalton hits eventually amounted to eight runs (two earned) and an 8-3 Dalton victory. Megan Tope and Danielle Dwyer each had two-run hits in the fifth, and Jessica Carmichael made it stand in the pitcher’s circle. Carmichael, who went 2-for-3 with two runs scored, pitched a complete game. She allowed three runs (all earned) on five hits, walking three and striking out 10, as Dalton ended Crestview’s remarkable two-season run (29-0 in 2005, 30-1 in 2006). A day later, after extended rain delays, Carmichael and Triad’s Morgan Ryan went pitch-for-pitch in the title game. Neither team scored through six innings, with Dalton squandering a second-and-third and nobody-out opportunity in the fourth inning. Carmichael struck out the side in the seventh, though, and the momentum carried to the plate for the Bulldogs. Dwyer led off with a double to left-centerfield, eventually moving to third with two outs. Allison Hamsher then reached on an error by the first baseman and Dwyer scampered home with the game’s only, and winning, run. Dalton had just five hits, two coming from Andrea Arney, while Carmichael tossed another complete game for the win. She surrendered just two baserunners (two singles) and struck out 13. In 2007, both Crestview and Triad had a chance to exact revenge. Instead, they were the ones left frustrated again. Dalton batted around in the top of the third inning of its semifinal against Crestview, scoring three times for a 3-0 lead. Carmichael provided five solid innings in the circle, but gave up a run-scoring triple in the third and a home run in the fifth. Dalton led 3-2 when the ball was turned over to No. 2 pitcher Arney in the sixth. Arney gave up a leadoff double to the first batter she faced, but recorded the next six outs – five via strikeout – to secure victory. At the plate, Arney had a two-run double in the three-run third. Carmichael, Katie Graber and Niki Lecon had two hits each and all either scored a run or knocked one in. Against Triad in the title game, Triad scored in the fifth to tie it at 1. They had runners at second and third with nobody out after knotting it up, but Carmichael struck out the next three batters. In the bottom of the fifth, Carmichael’s two-run double scored Allie Bednarz and Tiffany Mast, giving Dalton and Carmichael the cushion they needed. Carmichael struck out five of the last six batters she faced, and a state-title game record 15 on the day, allowing one hit, one walk and an unearned run. “I think our drive to repeat was more of us trying to prove the first one wasn’t a fluke,” Dwyer said. “We were a solid team, mentally and physically. We had camaraderie in the dugout, on the field, in school and out of school. The 2007 Div. IV state softball championship Dalton team consisted of (front, from left) assistant coach Rick Carmichael, Collen Hostetler, Jackie King, Katie Seese, Jessica Carmichael, Danielle Dwyer, Lisa Allison, Elle Jackson; (back) assistant coach Cherie Marthey, Michal Hostetler, Karissa Eckinger, Nicole Lecon, Allie Bednarz, Katie Graber, Jillian Husted, Andrea Arney, Tiffany Mast, Shelby Camichael, head coach Jessica Miller and assistant coach Diane Merriman.